In order to be a coveted dental practice in your community, you need to outfit your practice with the proper dental clinicians, assistants, office staff. You already know that. But what about the other aspect of your practice — software? Purchasing the right practice management software for your practice is just as important to your success as hiring the right staff. However, before we get into the why, let’s take a quick look at the what. Let’s be honest, no practice management software out there is offering their system, services, and support for a price you’ll like. So instead of focussing on the price, it’s important to focus on what quality software should offer. If you’re going to pay the big bucks, you had better be getting your money’s worth. Is this dental software worth the expense? Will this software grow with my growing practice? Is this software innovative and always finding new ways to further enhance their services? Does this software provider care about me and my practice or just my credit card? 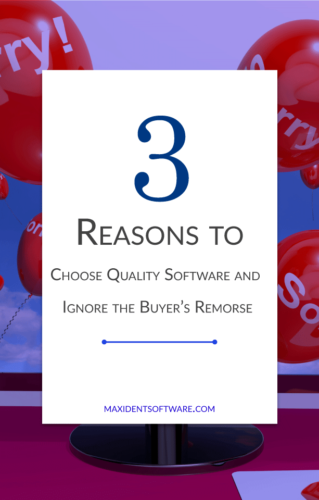 Once you’ve found several software packages and you’ve looked at the numbers, you are probably suffering from buyer’s remorse already, and you didn’t even hand your credit card over to the software provider of your choosing, yet. Before you back out of making a vital decision, here are 3 reasons to feel completely confident about moving forward. That’s what you’re thinking, isn’t it? How will this software help my existing patients and provide me opportunities to acquire new patients? If you’re not thinking this, you should be, and honestly, your software providers should be thinking this, too. Look at the promise the software provider is making. Look at their purpose and their vision. Does it sound like they actually care about their clients’ practice or does it seem a little flat and apathetic? As an example, our vision is to “empower health professionals with intelligent technology while building relationships and touching their hearts through exceptional service.” Our meetings always start with, how can we help our clients have a more successful practice? Choosing quality software means choosing software that will benefit your patients, existing and potential. And just like your patients are priority one when it comes to making these decisions, the software you choose should make the client (you) their number 1 priority. If you and your practice aren’t their number 1 priority, move on. You put your patients first. Always. That’s the rule you live by. But what comes next? Your team. These people are your bread and butter and they are a lot of the reason for your success. So why not treat them like gold by providing them the gold standard in practice management software. Investing in your team is investing in the life of your practice. Putting quality over expense means that you are putting the needs of your team ahead of your sales, and everyone knows the more satisfied your team is, the more productive you will all be. It honestly doesn’t matter what item you buy, this applies. Do you choose a computer off the shelf just because it’s the cheapest one, or do you look at all your options and choose the computer that best suits you and your needs? I would hope you’d choose based on your needs. If the computer you choose doesn’t have everything you need but it’s cheap, it won’t be worth a thing to you. Sure it cost you less money, but it might as well be a cheap paperweight. Making a decision about your practice software requires research. If you are only looking at expense then you are missing some vital information that will help you make a more beneficial decision. Basically, you have to ask yourself, will it help your practice or hurt your practice in the long run? Remember how I said in the beginning that expensive software isn’t always quality software and vice versa, sometimes, a software company comes along and offers quality software for a decent price. In our case, we are offering our Maxident license at absolutely no charge. Now, you can have everything and more to increase patient retention, assist in making the lives of those on your team easier, and even start increasing your production and therefore your profit, all without breaking the bank. I know how this sounds, but we have made a vital decision to give dental professionals like you a leg up in the industry by providing you with quality software for the price of $0. If you want to take advantage of this offer, and I know you do, click on the chat box on the bottom right to talk directly to our Sales Manager, Christian.